This kind of assessment is played out hundreds of times a day by every one of our employees and managers. And frankly, our products and services are coming up short more often than we care to admit. In the year since my first book was published, I've had the opportunity to meet thousands of new people. On the upside, I have heard wonderful stories about the power of communication and how important the communicator's role truly is. Everyone is looking to improve how he communicates! I was also struck by how much I, personally, had missed the boat. The idea of how we use people's time and attention is much bigger than this simpleton ever could have imagined. It radically shifts how we create value for others. the a-ha moment A few months ago, I had the opportunity to speak at a CEO summit. Touching briefly upon how important people's time is to them, I then moved on. The first people to come up to me after the presentation were the CEO and executive vice president from a firm in the field of life science. (They've asked to remain nameless. You'll see why in a moment.) The CEO said, "I've gotta tell ya, you were wrong about something." My heart sank...until he finished his thought. "Your idea about leadership being accountable for wasting people's time, or using it wisely, is dead-on. What's off is your timing. Leadership accountability is not five or more years in the future, it's now. "We just parted company with our president for this reason." He continued, "The people we've hired are not tolerant of anyone or anything that wastes their time. Because he didn't get that, we were about to lose some very talented employees -- like our director of marketing. That would've been a significant loss to the company relative to losing a president. So the president is gone." woah That story, and its consequences, was a whack upside my head. I started looking at my own work and the work of friends and clients through a new lens. One of those friends recently completed a major communication audit in her firm. Typical of the results were this mid-manager's comments: "Hey, I've got 10 minutes with my team every morning. Only 10. If what these communicators send me isn't useful to that day's priorities, I put it in the 'to be read' pile. Do you have any idea how big that pile is?" That manager, and everyone in our audience, lives and works in a world where the scarcest resources are time and attention. the lessons learned When I added up all the conversations I've had over the past year, some patterns began to emerge. The idea of focusing on how we use people's time is bigger than K.I.S.S. (keep it simple, stupid), or writing for sound bites, or creating meetings-in-a-box. It's more important than dealing with strategic themes, packaging change or focusing on faster downloads on your employee portal. So the following definition, rules and ways to get there didn't come from any one firm's "best practices." They came from fork-lift drivers, bank tellers, nurses, stockboys, lawyers and computer programmers -- the real people within our audiences. That's because the biggest lessons we can learn will always come from the people who actually use our services. 1) CREATE THE SPACE AND TIME TO THINK. 2) DESIGN USER-CENTERED & TASK-ORIENTED INFORMATION. BIGGEST IMPACT: For many of us, this turns our role inside out. * Creating the space and time to think is mostly about meeting design, brainstorming, workouts and training design; not the usual starting places for most communicators. * User-centered information means truly understanding our audience's needs. * Task-oriented information -- instructions, guides, self-facilitated workouts, production data made useful through organization, etc. -- is not where most of us focus. Because of this, one recent communication audit found, that "corporate information is not useful information." POTENTIAL UPSIDE: With productivity becoming ever more critical, communicators who passionately follow these two rules will have a major effect on the bottom line. POTENTIAL DOWNSIDE: If we don't make this shift, more and more of our stuff will be ignored. Guaranteed. 1) HELP MANAGERS COMPETE ON CLARITY. Instead of just streamlining and editing what goes to managers, help them organize the information that does come at them, and tell them how to use it for meetings. Bank of America is in the early stages of one such effort called Face-to-Face. First they performed a communication audit from the front-line employee's perspective -- giving them a much greater understanding of why people would spend their time and attention on corporate-supplied information. Then they designed Team Huddle templates for action-oriented communication. In a 10-minute meeting, the Huddle tool assists managers in translating info into action. The tool was based on Bank of America's own coaching discussion approach, as well as research on behavioral communication (downloadable free at www.simplerwork.com). Finally, they held training sessions. Not just for field managers, but for communicators -- so they understood how to change their approach. 2) MAKE IT EASIER FOR PEOPLE TO FIND WHOMEVER OR WHATEVER THEY NEED TO WORK SMART ENOUGH, FAST ENOUGH. IT and knowledge management departments hold the keys to this wondrous kingdom. 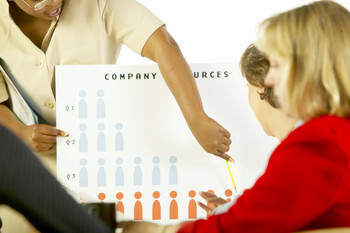 Human Resources, leaders, managers and training departments are the clients who have the needs. Find new ways to marry these two sets of stakeholders and magic happens! Here's one example: Recently, Merck held a global HR meeting in New York City. Before and after the offsite meeting, a virtual chat space was created. Everyone who was to attend the actual meeting, and hundreds more who could not attend, met online, laughed together, learned together and shared insights about the upcoming strategic goals. * A unique space and time was created for thinking about the new goals. * Hundreds of people shared project-specific information. By following these rules, Merck created a far deeper understanding of strategies and direction than any formal "communication" effort ever could have done. Yet the HR senior exec in charge, Wendy Yarno, continually emphasized how much this forum changed communication within the organization. 3) CHANGE WHAT YOU MEASURE. * What's the right information for different project or job responsibilities? * What's the best way to deliver different types of information (via manager, or employee portal or e-mail, etc.)? * In each instance, what's the right amount of info? Like Bank of America, you'll be amazed how much more you can learn. If truth be told, most of us need to get our fingernails much dirtier when digging for answers to these questions. 4) BECOME AS KNOWLEDGEABLE ABOUT USABILITY AS ANY TECH WEENIE. CAVEAT: All three of these sources focus on Web usability. Not every guideline is transferable to non-electronic delivery. But all the basic principles of great usability are universal! 5) THERE'S A NEW SPEED REVOLUTION. DISCOVER THE NEW RULES. It's pretty basic: The best performing companies all get employees and managers the information they need faster than the competition. When you start tracking the new measures, please ask lots of questions about how quickly people need to get different types of information. As in the Merck example above, the most direct vehicles and most valuable content will be "owned" by departments other than corporate communication. And task-oriented information will always need the most speed. 6) START TALKING ABOUT THE MOST TABOO SUBJECT OF ALL. * How respectful is this organization of people's time, and would your employees say you use their time effectively? This topic scares the bejeebers out of most execs. Because they know the answer. Start taking this taboo public. Bill Jensen is president of the Jensen Group and author of "Simplicity: The New Competitive Advantage in a World of More, Better, Faster." He will expand on the ideas in this article at the IABC international conference this June.